On the evening of April 11th our Navy League will hold a regular meeting at the Irish Times in JungCeylon, Patong. The first half of the meeting will be a memorial and remembrance ceremony for Jimmy Madigan, our Charter President, who passed away on Tuesday 26 March, 2013. The service will include several comments by friends, coworkers and family. If you have something particularly meaningful to express, or to have expressed in your behalf, please send by email to president@navyleaguephuket.org. Entry will be our standard donation, 200 baht for members and 400 baht for visitors. Entry will include a light buffet dinner. Keg sponsorships are open for 3,000 baht per barrel, just let us know by email. The second part of our evening will be a general networking and Independence Day promotional meeting. We are well underway in bringing this grand event to full speed and will be outlining our activity plans and development schedule, and of course, looking for the best place to slot in your efforts to support and be involved. 08:00 Gathering at the "Wall of Remembrance"
The Navy League of the United States Thailand Southern Seaboard Council, also known as Navy League Phuket, has committed to the upkeep and maintenance of the Phuket Tsunami Memorial "Wall of Remembrance" located in Mai Kao along the northwest coast of Phuket island. 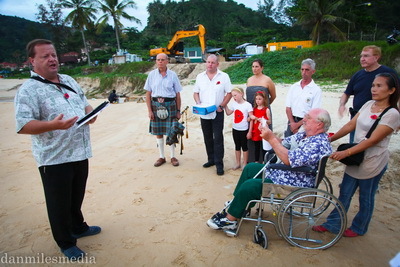 For the second year Navy League Phuket members have organized the cleaning of the memorial, the placement and upkeep of the 45 country flags representing tsunami victims, and served as commissioned agents of the Mai Kao OrBaTor government office to organize and announce the Memorial Service and Remembrance Ceremony. 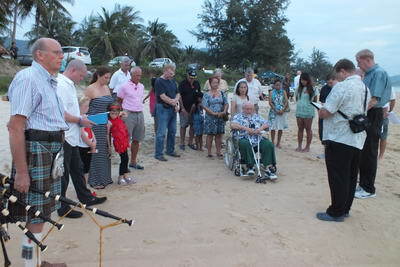 The Phuket Navy League wants to extend an invitation to come together with the intent of holding a low-key ceremony to pay their respects this Sunday on Karon beach close to the Karon lagoon, about 200 meters from the Karon roundabout. 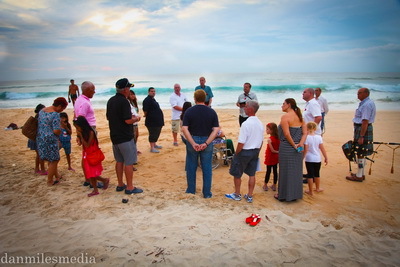 The intention is to meet in the car park area around 17:30 PM and then move down onto the beach for a short memorial service of about 30 minutes. This is not a religious service and there will be no prayers although time has been allocated for a period of "quiet reflection and contemplation". There will be no seating and no PA systems but there will be the opportunity for all to get involved in their way whether it is reading a short piece from literature or reciting the names of the fallen known to them. 18:01 TAPS + reading of "For the Fallen"
This is not a Navy League organized event, but we are fully supportive. Invitations are being sent to other groups to invite those that wish to attend. Our notification came through BBAP and Richard Valentine (084.060.8030) is available for further information, directions and help with transportation. Also Navy League president David Rucker can be contacted, see the contact page. 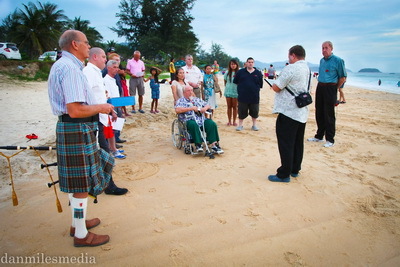 Phuket is a diverse melting pot of nationalities, all of whom have their citizens die in defense of their country. This invitation is open, and all are invited. The US Navy League hosted a Fourth of July, Independence Day celebration at Head Start School on July 1st, 2012. In America, the Fourth of July celebration remembers the Declaration of Independence from Great Britain in 1776 and is celebrated each year. The US Navy League in Phuket is a volunteer organization devoted to charitable projects to help the Thai people and to welcome visiting American sailors on ships that make port in Puket. Membership in the US Navy league is open to adults of all nations, whether or not he or she served their nation in the military or not. The Phuket Navy League has put together this American-themed day as a way of showcasing a bit of Americana to Thais, Americans, and other foreign expats living or visiting Phuket. On display were nearly 50 plaques presented to our Phuket Navy League, each representing a U.S. Navy ship that have made port of call in Phuket. Other displays explained the Navy League's COMSERV (Community Service) projects whereby Sailors, Marines and Officers work with members of the local community to paint schools, improve a playgrounds, or repair hospital equipment. In the nearly three years the Phuket Navy League has been formed it has assisted some forty-nine ships and has worked on nearly 100 Phuket COMSERV projects. Featured at this years Independence Day picnic was a great selection of American foods like apple pie, hot dogs and hamburgers, roasted corn on the cob, Tex-Mex ribs, New York deli sandwiches, ice cream, watermelon, and free popcorn. Highlighting the food stalls were five brands of genuine American Beer, something not often seen in Phuket. All foods were available by exchanging one or two tickets purchased at fifty baht (about $1.25) per ticket. On display were antique American cars, a 1956 Chevy truck and two fully restored World War Two U.S. military jeeps. Entertainment was provided by balloon artists, clowns, face-painters and a real Uncle Sam. Visitors were treated to lively American music, performing vocalists and a selection of great patriotic songs. At 2:30, Navy League President David Rucker opened the event and later Tim Swanson, acting U.S. Embassy Consul General from the American Embassy in Bangkok welcomed everyone. Remarks were followed by the American Pledge of Allegiance, the singing of the American National Anthem, and a short reading of the Declaration of Independence. The American flags on display were those given to the Navy League by visiting U.S. ships. Of particular interest and fun was a table with a ballot box and photos of two candidates for President of the United States. The election in American will be November 2012. Everyone was invited to participate in a straw vote for President of the United States: Romney or Obama. Printed ballots were available for everyone to place an "X" on their choice for President. The tally resulted in Obama receiving 61% and Romney receiving 39%. The day ended with a fireworks show, along with playing of American patriotic music. Everyone departed with warm memories of a fun American-style picnic, the smell of hamburgers and hot dogs barbequing on grills, and the sounds of children having a fun time. Everyone is invited to share in this celebration next year and thanks goes to the many local businessmen and businesswomen who provided food and drink and volunteered their time. 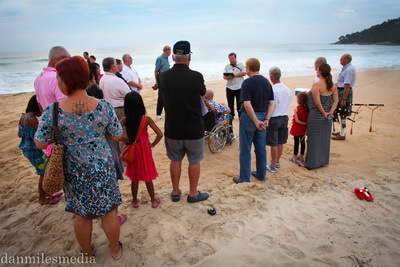 The Phuket Navy League has spearheaded a community service project that has refurbished the Phuket Tsunami Memorial's "Wall of Remembrance". 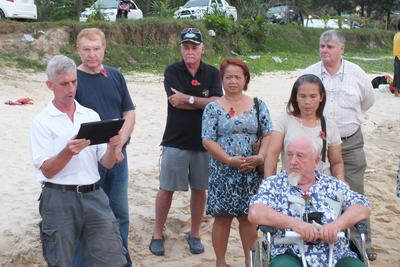 The Phuket Navy League has pledged to make this an annual community service project and thereby committed to the up keeping of the Tsunami Memorial year around. Everyone is welcome and if you would like to attend as a member of the US Navy League, please send me a RSVP return by 24 December so I can properly make arrangements for your reservations. Thanks, and the Best of the Holiday Season to you and your families! 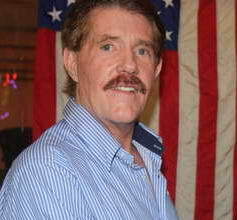 My name is Jerry Bourbeau, Past Post Commander of Post 1002 in Fallon, NV. 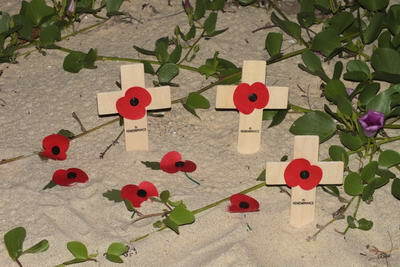 I am presently living in Patong Beach, Phuket and a Navy League member. In speaking with several vets here they are pretty much unaware of what the VFW has to offer them. 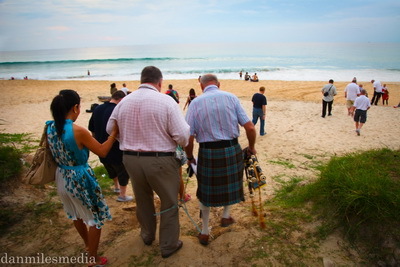 As a result of this I am looking into the feasibility of a new post in Phuket. The VFW requires all new Posts to start with 25 members. If any Navy League members are interested, or if they know of anyone here in Phuket that may be eligible for membership to please either contact me by phone, (66) 086.275.6107, or email jerryhb99@yahoo.com. More information about the VFW can be found at www.vfw.org. "Thank you for that very kind introduction. There are many people here tonight who rank among the true heroes of Naval Aviation, including George Walsh, Tom Hudner and Admiral Tom Heyward. I thank you for your service to our country and your leadership in this wonderful profession we all cherish. "On behalf of all the McCains who have served in Naval Aviation - from my grandfather who earned his wings as a Captain in 1936; my oldest son, Doug, who earned his wings in 1985; to my son, Ltjg Jack McCain, who earned his wings this past January - I thank you for the very generous recognition you have given my family. It has been a privilege for all of us to serve and to have played a small part in the first 100 years of Naval Aviation history. "Ever since reporting to Pensacola more than 50 years ago, I have had the pleasure of being involved with Naval Aviation in some capacity. I acknowledge that my early involvement was at times 'eventful' - and that my mishap record certainly contributed to the national debt. I doubt that I would last very long in today's Navy. "One of the benefits of living as long as I have, is that you get to see a lot of history in the making. And if you are paying attention, you can learn the lessons of what we did right, and what we did wrong. Both should be carefully studied. At the very least, we should make it our goal to repeat what worked well - and to avoid what didn't. "Tonight I would like to talk briefly about what I believe to be the key factor in the success of Naval Aviation over the past century. It is one of the things we did right. It has to do with leadership. "Although we just celebrated the 69th anniversary of the Battle of Midway, I want to return to that battle to make a fundamental point. At Midway, barely six months after the attack on Pearl Harbor, we faced an enemy supremely confident in their ability - not just to defeat, but to annihilate - the battered remnants of Halsey's Pacific Fleet. We were overwhelmingly outnumbered and outgunned. The Japanese brought 8 carriers, we had barely three; they had 11 battleships, we had none. And the Japanese had the best fighter aircraft in the Pacific - the Mitsubishi Zero - that easily dominated the slower, less agile TBDs, SBDs, F4Fs, and Marine F2As. "Making matters worse, our forces were plagued by faulty equipment. The Mk-13 torpedo was notoriously unreliable. In fact, not a single torpedo dropped at Midway by Torpedo 3, Torpedo 6 or Torpedo 8 even detonated. And the new electrical arming system on the SBD's had the annoying habit of randomly releasing the bomb when the Master Arm switch was selected. "But in the end, the battle turned not on numbers or equipment - but rather on the actions - and the leadership - of some truly extraordinary men. What they did at Midway has become the stuff of legend. "And men like Marine Major 'Joe' Henderson, who led his mixed squadron of F-4Fs and F-2As against the carrier Hiryu. Struck by anti-aircraft fire, his aircraft in flames, Henderson pressed the attack - on what would be his last flight. "My friends, the Battle of Midway was won not by superior equipment, and certainly not because we outnumbered the Japanese. We won because of the stout hearts and uncommon leadership that for one hundred years has been the hallmark of Naval Aviation. "My grandfather, who commanded a carrier task force in the Pacific during WWII, lived large and was always larger than life to me. He rolled his own cigarettes, smoked constantly, swore and drank more than he should have. He was known as one of the Navy's best cussers, probably not the sort of recognition one would want today. 'Slew' was his call sign. James Michener described him in Tales of the South Pacific as 'an ugly old aviator' but he was more than that, especially to his men. He was revered for his gregarious, salty attitude, and for his keen interest in his sailors and their thoughts on just about any subject. He made it a point to talk with pilots after they returned from a strike, asking them, 'Do you think we're doing the right thing?' Here was a 3-star admiral, taking time during the course of war to receive honest feedback from men under his command. My grandfather knew that if you ever stopped learning, especially from your men, then you also stopped leading. And he knew how to lead. -- Leaders inspire people; managers, well, they "manage" people and assets. -- Leaders think about protecting and promoting their people; managers think about protecting their own careers. -- Leaders take charge and accept responsibility; managers often pass the buck to higher authority for fear of making a wrong decision. -- LEADERS TAKE RISKS WHEN NECESSARY; MANAGERS ARE TAUGHT TO AVOID RISKS WHENEVER POSSIBLE. "Ronald reagan was a leader - jimmy carter was a manager. Halsey, nimitz, and spruance were leaders. Henderson, mcclusky, and waldron were leaders. If any one of them had opted for caution rather than courage when their moment of testing came, the outcome at midway would have been radically different. "My father - who was not an aviator but knew something about leadership - used to say that technical experts are a 'dime a dozen'. You can always find a man who can tell you how many foot-pounds of force are in a piston, or what the aerodynamic effects on a plane will be at a certain airspeed and altitude. But, he said, 'the business of leadership is another matter entirely. It's one of the most difficult subjects there is - to inspire in people subordinate to you, the desire to do a better job.' that is where true leadership trumps management - in the art of inspiring others to perform far beyond their self-imposed limits. "In recent years, I have often wondered if we have forgotten some of the more salient lessons of history, particularly as they apply to the development and selection of our military leaders. Have we allowed ourselves to be knocked off course to the point that we strive now to produce the 'ideal manager' rather than the next generation of true leaders? Have we focused too much on the strategy and tactics of the battle - and not enough on the leadership skills of those who really decided the outcome, not just at Midway, but at countless other critical battles throughout the past century? "I am at heart, and always will be, a Naval Aviator. It was my first profession and will always be my favorite. And just in case there is someone here tonight who does not understand why I place so much emphasis on leadership over management, let me be clear. The very nature of our profession demands it. No manager, however competent, will ever be able to inspire people to endure the hardships and make the sacrifices that we all know must come with Naval Aviation. Enduring those hardships and making those sacrifices is the price we pay for the privilege of defending our great nation. "So as we celebrate the centennial of Naval Aviation and begin to contemplate the next 100 years, I encourage all of you to look back on those who led us through our first century. I urge you to study their lives and their leadership styles. Then strive to be like them. Learn to inspire the men and women who work for you. Learn to lift them up, to give them meaningful responsibility, to allow them room to grow, and yes, even to make mistakes. Be slow to judge, and remember that many of our most gifted leaders would never have survived in a 'one strike' or 'zero defect' environment. If instead, your style is to be quick to criticize, slow to praise, and you are unwilling to forgive, I urge you to seek a different profession. And if you have not yet learned the power of redemption, I encourage you to read the biographies of Nimitz, Halsey, Boyington, Henderson, McClusky, and Waldron - just to name a few. "Now as I look around the audience - at some of the younger faces - I see another reason why I love Naval Aviation. I can imagine myself, 50 years ago, sitting in this audience, with a wide grin on my face, because I knew I was very lucky to be in this position. I envy you, with your ability to do the same things I did, only better. I can't turn back the clock, but I can live a little vicariously through you. Make us proud. Make us better. Our future belongs to you now. Make the next 100 years of Naval Aviation something old 'Slew' and John Waldron and Wade McClusky would be proud of. "Thank you and God Bless." Navy League Special Ship Tour aboard USS Peleliu (LHA 5) "The Iron Nickel"
This photo was taken by the ship's photographer and shows the entire visitor group, along with MCCS(SW) Dan Smithyman, Public Affairs Officer and our tour leader. The group was formed with members of the Royal Thai Police, the Tourist Police Volunteers, Community Affiliate members with their staff, Navy League members and some of their staff, and a few friends we got added on. The group was especially treated by personal explanations from the Executive Officer CAPT Jim Cox who met the group at several stops. Check back soon for an alblum of more pictures. Phuket Navy League members and friends are invited to support our council by attending the International Business Association of Phuket (IBAP) meeting on 10 December as IBAP introduces 3 Phuket business groups: SKÅL, the British Chamber of Commerce Thailand (BCCT), and our Navy League. The meeting will be held at the Dara Phuket hotel details are posted on the IBAP website. Bill Harris, Summmer Breeze Hotel. Includes: Light buffet dinner, no-host bar. This is our membership drive night. All members are asked to bring along at least one friend to introduce to our Phuket Navy League. In addition to networking and introductions we'll be showing some top videos of aircraft and carriers. Would all current members please bring their 1,700 Baht renewal subscription, also the cost of a new membership. Membership in the Navy League of the United States is open to all nationalities. Ship's Store We'll be taking orders for member's styled Polo Shirts @ 500 Baht, most members will want two! Are you signed up for our next Ship's Tour? ...Are you signed up for a membership? Our Phuket Navy League now has embroidered polo shirts available in white or black, with or without pocket. Men's sizes are European and woman's sizes are Thai. Also available, not pictured are T-shirts in white or black and high-quality money clips. All items are available at our regular meetings and ships welcome parties. Phuket Navy League President Jimmy Madigan met with Pol. Col. Grissak Songmoonnark Superentendent, Kathu Police Station to present him with an award of appreciation for support of the Officers and crews of the U.S. Navy ships that have been visiting Phuket, and for his continuing support of the Navy League of Phuket. Along with the certificate of appreciation Mr Madigan presented Mr Grissak with a hat gifted by Carrier Strike Group 11, USS Nimitz Strike Group. 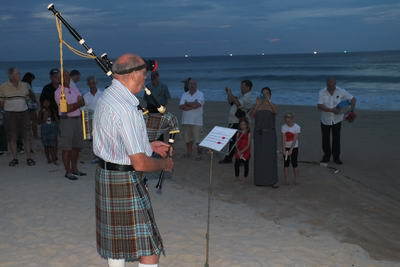 March 2010 the Phuket Post featured our Welcome Party for USS Cleveland (LPD 7), USS Rushmore (LSD 47), USS Patriot (LPD 7). Check out more pictures from the evening.